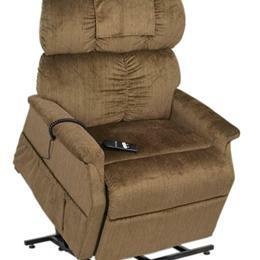 The Golden Comforter series lift chairs are high quality chairs made for long lasting reliability and comfort. The Golden PR-501M-26D lift chair is no exception. This is a plush and comfortable medium sized 3 position lift chair designed for total body support with an extra wide seat. Each of these luxury lift and recline chairs are hand made and designed to perform for many years and is backed by one of the best warranties. The Golden PR-501M-26D lift chair provides a smooth and quiet lift every time for the best performance and is also equipped with a Smart Tek system which assures a secure lift every time. These lift chairs also feature many fabric options to match your home decor as well as other options and a safety backup system. The Golden PR-501M-26D offers safety, comfort and quality craftsmanship. This specific model also features dual motors for an increased weight capacity of 500 pounds.